Any Question please call 0845 0941043. 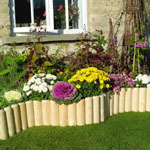 This garden border picket fence is ideal for flower borders and lawn edging. 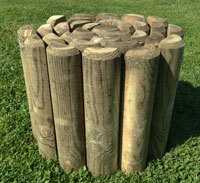 This wooden picket fencing is manufactured from treat FSC timber to prevent rot. This picket fence is easy to install, simply by hammering into place both end stakes, ideal to create a cottage garden look to your garden. This Cottage Border Garden Hurdle is Pressure treated hardwood timber. Looks well established from day one. Gives that rustic cottage look. Natural poles (not machine rounded). This rustic garden lawn border edging can be used to landscape borders, lawn edging, garden borders, flower borders and pathways. Gives that rutic cottage look. 12 years guarantee against rot.